FTF-I is calling for your support in the solidarity campaign for relief in areas affected by the floods that struck the South Indian regions. Several small-scale artisans have been affected and are in need of immediate help. More than 500 died and more than U$ 3 million worth of property and infrastructures were destroyed when floods hit vulnerable areas in Coromandel Coast region of the South Indian states of Tamil Nadu (TN) and Andhra Pradesh, and the union territory of Puducherry. Tamil Nadu and the city of Chennai, home of many producers, are particularly hard hit. 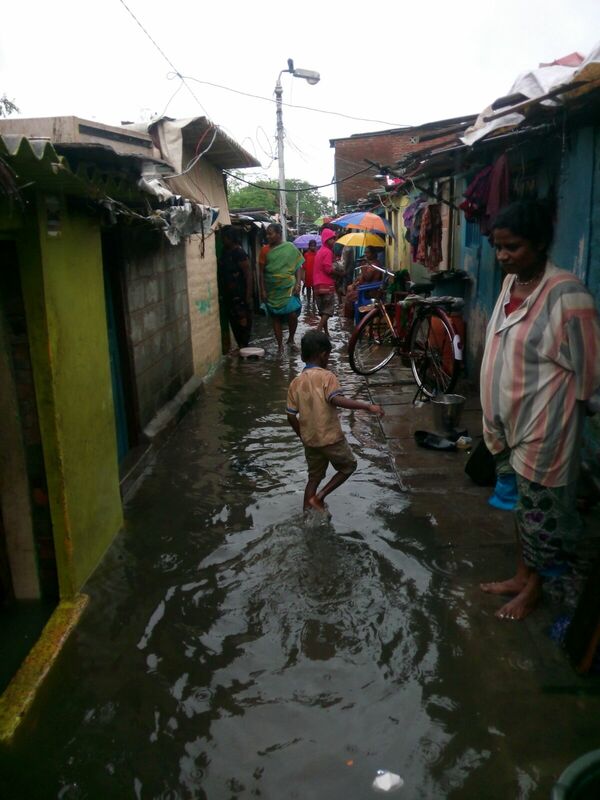 Fair Trade artisanal communities in the remote areas and villages of Tamil Nadu have reported several days of heavy rain and flooding with no access to transportation, food, water and shelter. Many small-scale artisan families are suffering loss of infrastructure and basic facilities. Many people have been displaced from their villages. The poor hygiene and sanitation situation comes as an extra challenge at this stage. Several ongoing relief works are already being undertaken by government agencies, along with the civil society in India, but a lot more needs to be done for restoration and risk management. To aid and support our artisan brothers and sisters in this time of need, Fair Trade Forum-India (FTF-I) along with its member FTOs (Fair Trade Organisations) is running a solidarity campaign- ‘Fair Trade India for Artisans of Chennai’, to support and help the artisan families who were severely affected in the flood prone areas of Tamil Nadu. Many Indian FTOs are giving financial contributions in solidarity to support affected Fair Trade organisations, especially in Tamil Nadu. FTF-I is coordinating and facilitating this initiative and is planning to support through medical camps, food and shelter options. In case you are located outside India and would like to contribute, kindly send a mail to FTF-I at ftfindia@gmail,com and we will let you know the process. For further details kindly contact us at ftfindia@gmail.com. MESH got the opportunity to participate in the AWA Holiday Mela on November 01st, 2015 at the American Embassy School, Chankyapuri, New Delhi. The AWA Mela directly helps more than 50 NGO’s from Delhi/NCR in its outreach support program. The NGO’s were allowed to display their items like crafts gifts, jewellery, apparel, furniture and plants. This event also included delicious food across the world and craft and fun activities for the children. This was followed by cultural activities like live band performances to add fun to the program. To give you a reminder, MESH is an Indian organisation practicing Fair Trade with disabled and leprosy affected crafts artisans, for their rehabilitation. We have shops in New Delhi and Hyderabad and work with disabled artisans from all over India. MESH works with a mission to provide opportunities for disabled and people affected by leprosy to achieve social and economic integration by trading. They works to train disabled people to produce goods, assist in obtaining raw materials, MESH ensures prompt payment for goods to provide constant cash flow and working capital for continued production. The brand of Literacy India, Indha, on the occasion of Diwali got the opportunity to organise their stalls at the commercial firms like Taj Hotel Resorts & Palaces, American Express, Royal Bank of Scotland and Indigo airlines with a spread in three different cities – Kolkata, New Delhi and Gurgaon. Diwali being the largest and brightest festival of India creates a memorable gifting experience for all buyers. Indha craft designed an eclectic array of exclusive handicraft items such as- scented candles, diyas, table runners, jewellery etc. With a purpose to provide a wide range of products to be selected by the buyers to decorate their homes with candescent lights and diyas along with the best gifting items to exchange on the occasion, were prepared by Indha artisans displayed and sold at these various venues. Commercial firms like Taj Hotel Resorts & Palaces, American Express, Royal Bank of Scotland and Indigo airlines, were quite impressed with this latest range and organized Diwali stall at their corporate avenues. They also had a successful exhibition at radio channel 92.70 FM and deemed university BITS Pilani NSS Oasis Stall. An amazing positive response was noticed from the organizers and customers as well. You can make a difference, as well. Every single purchase at Indha Craft, contributes to an artisan’s livelihood. Indha Crafts, began its journey with the hope of creating a change and uplifting such women from their vulnerable & destitute conditions, through vocational training in tailoring & stitching. MESH participated in the Diwali Bazaar organized by Blind Relief Association from 02nd to 08th November, 2015. MESH showcased their beautiful handmade products with the presence in the mela from 05th to 08th November, 2015 at CGO Complex, Lodhi Road, New Delhi. A variety of items ranging from cloths, accessories, stalls, candles, diyas, home décor and other gifting items were displayed at the stall. The Blind Relief Association focuses on providing education and training to the visually challenged people, enabling them to realize their potential and be self reliant.